Meyer Lansky was influential enough to draw hundreds of inquiries from law-enforcement agencies during his lifetime, from the FBI, CIA, Highway Patrol offices in dozen’s of states, local police, detective agencies, you name it, somebody wanted to know more about him. Strange, because as dirty and sticky as his hands were for the Mob, no charges seemed to stick to him. Lansky was born Meier Suchowlanski July 4, 1902 (died Jan 15, 1983) in Grodno, the Russian Empire. His father immigrated in 1909 to Manhattan and the family joined him two years later. By the time he was 13, Meyer was a tough-nosed hood who rolled drunks, manhandled local push-cart owners and hung with a group of like-minded young men who would eventually form a part of Lucky Luciano’s main strong-arm groups and bootlegging gangs. Although gang members like Bugsy Siegel seemed to love fights (and Siegel took real pride in his murders), Lansky was more cautious. When Joe Masseria needed to be hit, Lansky handled the details, Siegel, Vito Genovese, Albert Anastasia, and Joe Adonis handled the guns. Lucky Luciano held control of the New York Mob for more than two decades, and the men who handled his dirty work at the Villa Tammaro restaurant in Coney Island (on tax day, April 15, 1931) all had long careers in organized crime. Siegel and Adonis were assassinated, Lansky and Adonis were deported to Italy. Lansky, always in the background when crimes were committed, lived a quiet life in Florida until he died on January 15, 1983. Although he handled hundreds of millions in illegal funds from Mob crimes, he wasn’t lavish in his lifestyle. After the end of Prohibition in the early 1930s, Lansky setup gambling joints in Florida and Louisiana. He had at least a passing interest in Kentucky and Ohio clubs, but the New Orleans business was special to him, with slot machines sales and income topping the bill. After Lucky Luciano was deported in 1936, Lansky took advantage of the Swiss Banking Act of 1934 and set up a series of shell organizations to help launder both Mob money and his own.with a final holding spot of numbered Swiss bank accounts. His legitimate business operations had a tendency to lose money, but his casinos were always profitable. As more pressure came from local police and sheriff associations, Lansky paid handsomely to keep his name clean and outside of legal hassles. And, Lansky approved of a move into Nevada casinos in both Reno and Las Vegas. Mob money went straight into clubs like the El Cortez and the Las Vegas Club, with Bugsy Siegel and Dave Berman putting up a chunk of cash. When the building of Billy Wilkerson’s hotel on the Las Vegas Strip stalled, Lansky was instrumental in convincing his bosses that a more public organization and ownership of the soon to be Flamingo was a good idea. Unfortunately, Siegel was a better hitman than a businessman. The construction was a financial disaster, the casino opened and lost money, and only the death of Siegel would keep the Mob happy. Lansky didn’t give the order for Siegel’s hit, but he had to give his OK. A meeting in Havana with Lansky, Luciano, and a dozen other family heads sealed Bugsy’s fate. He lasted until June 20, 1947. After that, the team of Gus Greenbaum and Dave Berman handled things at the Flamingo with Moe Sedway managing the casino. Lansky got his weekly cut of the skim via bag man (including Siegel’s ex-girlfriend, Virginia Hill) and funneled the cash through a complicated series of shady but legal enterprises to turn the untaxed cash into clean money. He sent his own share to Switzerland, again, sometimes with the help of Virginia Hill. With the burgeoning success of Las Vegas, Lansky set his own brother up as a manager at the Thunderbird casino in town and later, when Cuba accepted Meyer as an adviser and then casino owner, he was a part of the Nacional Casino in Havana. Enormous profits were skimmed at the Thunderbird, and the Cuban casinos were a huge source of income. It was Lansky who arranged a $250,000 bribe in 1952 for President Carlos Prio Socarras to allow Batista to return to power. Once the military coup of March 1952 took place, Batista allowed gambling to be a major part of the Havana experience. Over the next six years, Batista took a nightly share of the profits from all casinos slot machines, often ignoring the cut of the craps and blackjack tables. This allowed the Mob to help finance the building of several more casinos (although the Cuban government was footing a large share of the cost also). While the Mob profited, the citizens of Havana as a whole didn’t see much of a change in their living standards. Wealthy tourists flew to the island, spent lavishly in the hotels and casinos, and money flew away to the states (and Switzerland). Casinos like the Capri, Commodoro, Deauvill, and Sevilla-Biltmore were split between several Mob families. The Nacional, Montmartre Club, and the new Habana Riviera were very successful for Lansky and the New York group, with the Riviera making more than $3 million in its first year of operation. Unfortunately for the Mob, their greed (and Batista’s), were too much for Fidel Castro to stomach. The Cuban revolution of 1959 put an end to the gambling as rebels stormed the hotels, trashed the casinos, broke into the slot machines and even parking meters outside, and the tropical dream came to an end for Lansky. By that time, even his illegal clubs in Miami were under a cloud and soon to be closed. Although the Mob’s losses in Cuba (and Lansky’s, estimated at nearly $10 million) were substantial, Las Vegas was still a great stream of skimmed cash. When the US Government indicted several casino executives of illegal cash transactions, Lansky was never touched, although he drained millions from clubs like the Thunderbird, Flamingo, Tropicana, Sands and even Caesars Palace. He was indicted for income tax fraud and fled to Israel (if this sounds familiar, yes, the Hyman Roth character in Mario Puzo’s The Godfather was patterned after Lansky) but returned to the US and stood trial in a botched case that he easily beat. He lived another ten years, lamenting his losses, dabbling in real estate, and at one point, transferring $15 million to his brother Jake’s bank account when he was having more trouble with the IRS – this according to his daughter Sandra. How close was the Hyman Roth character to Meyer Lansky? Roth’s statement to Michael Corleone of “Michael, we’re bigger than US Steel,” was a direct quote from Lansky to his wife in their Miami home that was picked up on tape by the FBI. Lansky passed away on January 15, 1983, a free man. Sometimes Charlie Mapes doesn’t get the respect he deserved for his work in the Reno gaming community. I mean really, here he is getting punched-out by boxing champion Jack Sharkey! The event was the 85th Birthday party of Ancil Hoffman, who was well-known in Reno as the manager of Heavyweight Champ Max Baer. The Boxing Champion’s party was the brainchild of Bill Pettite, a boxing fan and nephew of Nick Abelman, one of Northern Nevada’s gaming pioneers featured in the book, Mob City: Reno. Mapes decided to hold the event and foot the bill for 350 guests at his casino in 1970. It turned out to be one of the largest gatherings of boxing legends ever, and included James J. Braddock, Jersey Joe Walcott, Willie Pastorano, Jackie Fields, Fred Apostoli, Jimmy McLarnin, and “Two Ton” Tony Galento, and of course Jack Sharkey! Even Governor Paul Laxalt showed up. Gaming pioneers were there too, including Warren Nelson (Club Cal-Neva), Norman Blitz (Tahoe Cal Neva, Bank Club, Holiday Casino), Wally Mason (Horseshoe Club), and Harvey Gross (Harvey’s Casino). To be fair, Charlie Mapes needs to be considered a gaming pioneer too. When the Mapes hotel-casino was finished in 1947, the 12-story tower was the tallest building in the entire state. The opening brought new attention to Reno and a who slew of new players, many with plenty of money, from places like Detroit, Kansas City, and the east coast. The hotel had fancy dining, a nice showroom, and a casino on the top floor that included blackjack, craps, and roulette with fancy die-cut, metal-inlay chips.. Although the casino was often leased out to other operators, Charlie Mapes owned buildings in downtown Reno, ran the concessions at the airport, and opened Mapes Money Tree casino on the corner of Virginia and 2nd Streets in 1969. It closed ten years later. The Mapes hotel-casino was closed in December 1982. I just love this photo of the Ta-Neva-Ho. Taken in the late 1930s, it shows what Lake Tahoe is like every winter – snowy! No kidding, right? Well, not everybody has a chance to see the amazing lake that straddles the California and Nevada state lines. This club, built and opened in 1937, stands along the North Shore of Lake Tahoe – a couple of football fields away from the water. From the back steps or the parking lot, you can still see the clear blue expanse of the lake through the huge pine trees. They stand much as they did seventy years ago – think taller. The Ta-Neva-Ho was more than just a casino. As you can see in the photo, the club was housed in a building (don’t say strip-mall!!!) that offered dining, gaming, bowling, sports betting, and even a drug store and post office. If you take a look at the building today (it remains as the Crystal Bay Club), it may seem too small to have offered so much. However, in a small community like the Crystal Bay, the locals were thrilled to have anything to do during the winter. There were less than 1000 people in the general vicinity, and a drug store and post office were mighty handy to have nearby. The Ta-Neva-Ho was originally built by Norman Biltz and Pete Bennett. No, the name is not Native American, nor does it stand for “white man gambling.” Biltz was also involved in the Cal-Neva casino, closer to the lake. Over the years the Ta-Neva-Ho had several owners including our old friend Nick Abelman. He held points in the casino, and it seems many other people did too – right up until the present. Today’s Nevada Gaming Control Board insists on knowing (and approving) every owner, but back when the clubs were fun – dangerous – exciting – new, each spring season brought at least a few new “partners” to each venture at the lake. One of those “partners” who showed up was Frank Fat, a Sacramento restaurant owner. When he first arrived at Lake Tahoe his friend Otis Babcock booked a cabin for him at Bijou, but the day after he arrived, Fat was asked to leave. That day it sucked to be Asian. A few years later, Fat turned the tables on the situation when he and his friends, Babcock, Art Nyberg, and Nick Abelman bought the entire block the Ta-Neva-Ho sat on for $125,000. Each owned 25%, and Fat took the gaming license, even though he ran only the restaurant. In classic early Nevada style, Frank Fat fronted for a host of owner-operators who preferred to keep their gaming interests silent. The casino ran beautifully for several years and the partners sold their property in 1945 for $300,000 to a group of investors lead by Johnny Rayburn. Fat again stayed on to run the restaurants. These stories and many more at found in the book “The Roots of Reno,” written by yours truly, AL W. Moe available from those crazy online bookstores like Amazon and Barnes and Noble. 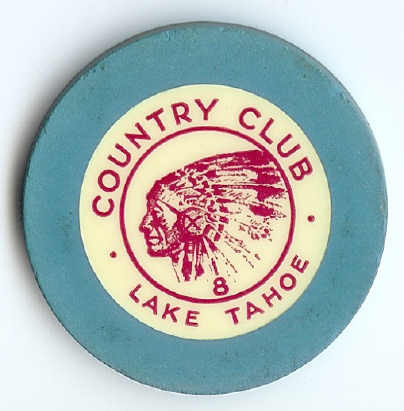 The Stateline Country Club was situated on the California/Nevada state border on the South Shore of Lake Tahoe. Originally owned by Cal Custer, the club had a reputation for fun during the short summer season at the Lake before winter snowstorms closed the only link (highway 50) from the Placerville area of California and the Nevada side that lead to Carson City. Nick Abelman purchased the small casino with his partners, Bert Riddick and Steve Pavlovich in 1933. This chip is from their early days at the club, although it may not have been on a table until 1935. Abelman’s casino inside the Riverside Hotel – called the Riverside Buffet, also used crest and seal chips. His “Ship and Bottle” was one of the nicest casinos in Nevada used even more elaborate chips on their fancy tables.